When Perry is called on to settle a land claim in Manzana Valley, he soon finds himself involved in a murder case when the key witness in the boundary dispute is blown up by a homemade bomb and our hero�s client is charged with the killing. Location: The courthouse is in fact Santa Monica City Hall which does have some court rooms. Submitted by Eric Cooper, 3/30/2009. Pictures here and here. + The fictional "Manzana Valley" is once more the setting for Perry's case in ep#186, TCOT Decadent Dean. The "Manzana County Court House" seen in that episode (23:09) is an older and much smaller building than the courthouse used in this episode. Added by Gary Woloski, 2/5/14. 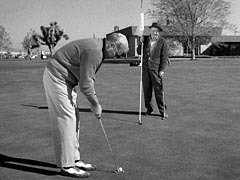 + Much of this episode seems to have been filmed at the Green Tree Golf Course, Victorville, CA. You can see the attractive modern building on their website. 01/04/15 Welshwoman. + Wow!! That little river must have been working overtime: what was a cacti studded desert in the episode seems to be a lush greensward today. Submitted by Notcom, 010616. According to the IMDb, the real name of actor Dirk London is Ray Boyle. Submitted by gracep, 12/7/2010. Although credited, Ray Collins (Lt. Tragg) did not appear. Submitted by gracep, 12/7/2010. Both Harry Carey, Jr. and Pat O�Malley were regular cast members in Disney�s Spin and Marty series. Submitted by Masonite, 7/11/2011. + Don't leave out the 'J': Just as Michael J. Fox had to add the 'J' to his name to distinguish himself from Perry Mason actor Michael Fox whose career was active through 1995 just a year before his death, J. Pat O'Malley had to have a different name than Pat O'Malley, an actor whose career spanned the years 1908-1962. The two O'Malleys paths came close on The Twilight Zone: While J. Pat O'Malley appeared on four episodes, Pat O'Malley only appeared on three. Submitted by Wiseguy70005, 4/20/15. Some other cast appearances: Paul Fix appeared on the original Star Trek as the first doctor on Capt. Kirk's Enterprise before DeForest Kelley's Dr. McCoy appeared. (John Hoyt had appeared as the doctor on Capt. Pike's Enterprise. All three actors have appeared on Perry Mason.) Sarah Marshall (later wife of Karl Held) played Capt. Kirk's former love interest in "The Deadly Years" in 1967. Both actors also appeared on The Twilight Zone, Paul Fix in 1964's "I Am the Night-Color Me Black" and Sarah Marshall as the mother of the "Little Girl Lost" who got lost in another dimension in 1962. Philip Ober appeared in 1964's "Spur of the Moment" and J. Pat O'Malley played "The Fugitive" in the 1962 episode along with Wesley Lau. 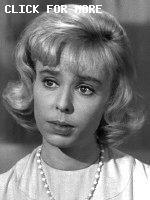 June Vincent appeared in a 1967 episode of Ironside and Paul Fix in a 1970 episode. Submitted by Wiseguy70005, 4/20/15. Paul Fix and William Hopper were reunited in the 1956 movie The Bad Seed. jfh 17Oct2017. Word of the day: Perry Mason used the word �riparian,� which refers to river banks and/or adjacent wetlands. Submitted by gracenote, 7/12/2011. + See"geographical questions" Comment, below, for illustrations of "riparian". Added by Gary Woloski, 2/7/14. Deliciously dapper David Gideon (Karl Held) delights us again with his carefully memorized detailings of legal doohickeys and, of course, his dandy dress and dazzling smile. Eight appearances down, one to go. Submitted by gracenote, 7/12/2011. Character Names: Although Paul Fix is credited here only as �Prosecutor,� we know from Fix�s other four PM appearances that his character�s last name was always Hale, and his first name was either Jonathan (�TCOT Barefaced Witness�) or Darwin (�TCOT Angry Mourner�). He was mainly used when Perry would try a case outside of the city. Submitted by cgraul, 11/9/2011. CARS. (1) 1961 Mercury Commuter 4-door station wagon, white, "Manzana Valley Inn" logo on doors, Lic No VNE 546, Matt Lambert ("Uncle Matt" to Judy). Half-way through the episode Della drives this car in a re-enactment of events to determine timings. (2) 1957 Ford Custom 4-Door Sedan, 2-tone white/medium, Lic No E 78975, U.S. Forest Service markings, District Ranger Frank Deane. "Custom" was the base model Ford in 1957. The "E" prefix on the licence plate is unclear, but this is certainly a California EXEMPT PLATE. (3 & 4) two 1961 Ford Fairlane 4Door Sedans, B&W, "SHERIFF" crest on door. One background car: the white 1961 Ford Fairlane 4Door Sedan in opening sequence parked beside the "MANZANA VALLEY AIRPORT" sign. Added by Gary Woloski, 2/18/13. The Wisconsin murder occurred in the home of County Commissioner James Chapman in Wood County near "the small city of Marshfield . . . two days after Christmas 1922". A home-made bomb which had been sent through the mail exploded while being unwrapped, maiming Chapman and fatally injuring his wife. It didn't take long to identify the prime suspect as farmer John Magnuson, who was in dispute with the County Commission over imposition of water drainage measures and resultant taxation. Magnuson, dubbed the Yule Bomber (full story at the link), was charged with first-degree murder in the death of Mrs Chapman. The trial opened on 15 Mar 1923 at Wisconsin Rapids. Arthur Koehler was one of several scientists called to give expert testimony in their own field. Magnuson was found guilty on 31 Mar and sentenced to life imprisonment. He served most of his sentence at the state hospital for the criminally insane, escaping temporarily for what he called a "holiday" in 1940. After being paroled in 1952, Magnuson died at age 78 in 1957. The Wood Forensics of Arthur Koehler were also featured in the Feb 1935 issue of Popular Science pages 14,15,114. The common elements in the two stories (the roving Wisconsin River & the roving river of this episode; disputes involving land rights & river water; the bombings; the late-December timings; and use of FPL experts) support the credibility of the Post-Crescent article. It also seems likely that the seeds for the newspaper article must have been planted by Sam Newman, Paisano Productions or CBS. I believe that it's a fantastically bizarre coincidence that the newspaper article preserved on the internet was published in "Appleton" WI and that the "Appleton Land Company" is the likely root of the name of "Apple Valley" CA which, in turn, I believe is the real-world location of the "Manzana Valley" of this Episode#138. "Manzana" (sp.) = "Apple". Added by Gary Woloski, 5/5/14. Map showing Marshfield - Wisconsin Rapids - Appleton here. Madison can be seen directly to the South of the highlighted route. Raymond won the 1961 Emmy for Outstanding Performance by an Actor in a Leading Role [IMDb Awards]. Mike Bedard 3.8.15. +The handsome Bennett also appeared as Tarzan in the 1930s, under his real name, Herman Brix. He lost the role of MGM's Tarzan to Weissmuller due to a broken shoulder, but played a well-spoken, true-to-the-books Lord Greystoke in The New Adventures of Tarzan, released as both a feature and a serial in 1935. Worth watching! Submitted by JazzBaby, 3/6/2019. The opening credits are a little different in that the title, �Based upon characters created by Erle Stanley Gardner� takes up the greater part of the screen. In previous episodes, it is to the right of the Justice statue, just like the episode name. Submitted by gracep, 12/7/2010. + Also in the previous episode "The Unwelcome Bride." Submitted by Wiseguy70005, 4/20/15. This was one of the more convoluted episodes in that most of the discovery occurred in the courtroom, and the events that led up to the murder were quite an entanglement�very difficult to follow. Submitted by gracep, 12/7/2010. I thought that fans of "J. Pat O'Malley", playing Desert Rat Seth Tyson in this episode, would enjoy seeing and hearing him in his previous career as "Pat O'Malley", British tenor and principal vocalist with "Jack Hylton and His Orchestra". Here is Pat at age 32 in a portrait made by Maurice Seymour, Chicago's "Photographer to the Celebrities", in Spring 1936 (Back of photo here & alternate link). The photo was taken just a few weeks before the end of the eight-month-long 1935/36 Jack Hylton tour of America. When Hylton returned to England, Pat stayed in America, taking on the initial "J." to distinguish himself from the other Pat O'Malley already in American film. You can see and hear Pat on this 1931 Pathe Newsreel in a rehearsal session of the song "Choo Choo" (the final HMV recording made on 3 Feb 1931 is dubbed onto this video). Pat is the taller fellow in white shirt and tie, no vest, and is the vocalist furthest to the left when the backup trio joins him. Bandleader Jack Hylton is the middle man (jacket & tie) in the trio. The Official Jack Hylton Website is here. "click to enter" then listen to downloads, etc. A thumbnail sketch of Maurice Seymour Photographers is here, 4th item down. The most complete online bio of "J. Pat" I've found is provided by Fans of the Original MMC. Here is J. Pat with other cast members of Ten Little Indians on Broadway, Halloween 1944. Added by Gary Woloski, 10/9/11, revised 5/13/14. + For authoritative answers to any geographical questions about Manzana Valley you would have to ask Samuel Newman what he was imagining when he wrote this episode. See ep#186 Trivia, "Familiar Names" for an explanation. The probable filmed locale is Apple Valley in San Bernardino County. Check out the lime mines, golf courses and the desert riparian habitat of The Mojave, a roving river that's upside-down & backwards. Added by Gary Woloski, 2/5/14. + As noted in the Location trivia above, "Welshwoman" has claimed to have spotted the golf course in Victorville, right next-door to Apple Valley. Gary Woloski, 1/6/15. To pile on the complaints, another major premise of this show - that the surveyor's intent is crucial to determining the boundary - just doesn't hold water either (though admittedly my background in riparian accretion is lacking). Certainly intent is crucial, but it would be the intent of whoever conveyed the deed, as expressed in the property description; the surveyor simply follows directions (determining the dimensions if the description is vague - e.g. "from the road west to the middle of X River" - or actually marking the land if the description is explicit - "from the road 150' west")...there's nothing for him to "intend". Submitted by Notcom, 010616. +Agreed, Notcom. I was a draftsman for a surveying company for 30 years, and while our surveyor testified in several land disputes, he was merely supporting what he had written. The whole point of a legal description is putting it in writing, unambiguously we hope. Descriptions would say "with the meanders" but specify actual corners in the river at the time of the survey. A definite line is needed to calculate area. I suppose a person could do something to prevent the river moving into his property if he wanted. Submitted by DyNama, 1/9/2016.